Dubai offers a real Arabian experience. Home to some of the world's most luxurious hotels and the world's most astounding construction projects it is not all just sea and desert. The city itself holds an amazing history and culture. Visit the old Bastakia district which will transport you back in time as you wander through the traditional courtyard houses which are today still cooled by ornate wind towers. The Dubai Museum, housed within the beautifully restored Al Fahidi Fort, was erected around 1787 to defend the city against invasion; the museum's diverse collection of exhibits offers a fascinating insight into the rich history and cultural heritage of the area. Take a walk round some of the beautiful mosques, meander through the busy atmospheric souks selling the finest gold and exotic spices and take a ride on a traditional wooden abra across the hectic Dubai Creek. 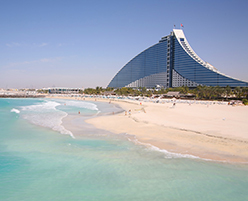 There is no getting away from the fact that Dubai is also a perfect place to visit for some quick rest, relaxation and pampering; this desert metropolis combines the best of city life and beach-side relaxation. Treat yourself in one of the many amazing shopping malls bursting with the latest luxury items, the duty and tax free prices can make a good deal truly a great bargain. Soak up a few rays of sunshine on white sandy beaches or by the side of your beautifully landscaped hotel pool. Feeling energetic? Then tee-off with a round of golf on one of the city's award winning lush sun-kissed golf courses. As the sun begins to set then it's time to take a fun filled trip out to the desert for dune bashing and a camel ride followed by a scrumptious desert dinner on Persian carpets beneath the stars with a belly dancer to entertain you or, enjoy a relaxing candlelight dinner as you gaze at the sparkling city lights from the comfort of a traditional dhow sailing through the famous Dubai Creek. 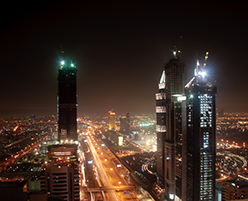 From morning to night, Dubai offers the elegance and service you would expect from any luxury holiday and so much more. The best time to visit is between October and May. The hottest time is from June to September with little rainfall. London to Dubai is approximately 7hrs with direct flights operated British Airways, Virgin Atlantic and Emirates from both London and some regional airports. Passports must be valid for a minimum of 3 months after the period of intended visit.